Across the pond, RC models just keep getting bigger, like this 11.15-foot-span AT-6 Texan piloted by Adolf “Poldi” Leopold. Built from a Petrasuch kit, the fiberglass model is controlled by a Weatronics radio and has Wabo pneumatic landing gear, a fully detailed cockpit, functional lights and smoke. You’ll get chills when you listen to the Moki 250cc 5-cylinder engine on flyby! 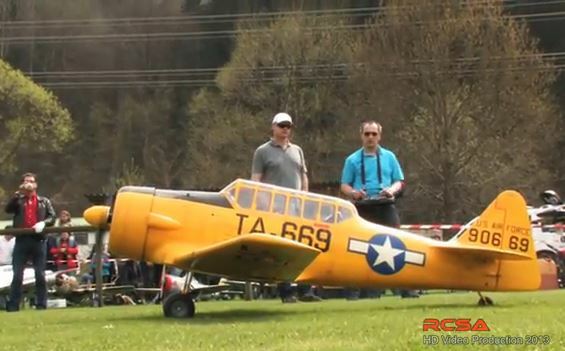 Thanks to RCScaleAirplanes, who captured this video footage of the model’s first flight this April in St. Margarethen, Raab, Austria. I have seen this field on videos before, is it optical or is the field as short , narrow and obstructions as they seem ? loved the part at the end where he is posing in front of the running prop without any means of restraint. can’t believe the ending of this video. The guy is sitting in front of his plane with the engine running. A radio glitch or other anomaly could have caused the engine to rev. I’m sure his happy smile and “thumbs-up” would change quickly if the plane surged forward and the prop cut into him. Wonderful! Just like the eal thing! Congratulations. Thank you for brnging this to us! Nice! However… major safety faux pas (or however you say it in German) where pilot kneels in front of idling engine w/o anyone securing the airplane. If it throttled up for any reason, the poor bloke would be mince meat! Simply beautiful! Congratulations to all! new to rc aviation ,but this is one of my favorites and can listen to this video and hear this pretty sounding aircraft for ever! !